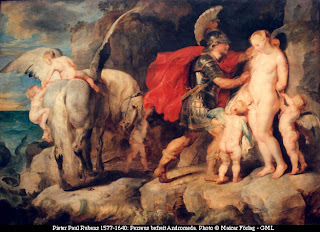 Here's Ruben's rendering of the Perseus and Andromeda myth. Beautiful, lush. Perseus, with the head of Medusa as his secret weapon, looks unbreakable. And things go well until the wedding feast. But what does Andromeda make of it all? In Ovid, love is easy. If she wants to be saved.